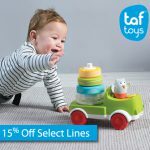 Baby Brands Direct customers can take advantage of an exclusive offer from Taf Toys for an extra 15% off trade price on 4 of its popular lines. This is no April fool’s joke so take advantage now as this offer ends on the 14th April. The brand is well established in the UK with its frequent coverage in the media for its various product awards as voted for by parents as well as expert industry judges. The brand has in the last 18 months also undergone a refresh to its packaging and logo modernising its appeal and making it more universal. Of the special offer products, 2 are from their car travel toys range which presents quite a niche category for retailers to tap into. The Taf Toys Sounds and Lights Wheel Toy is a classic toy that hags off the back of a front seat for baby to access. It has a fun, clicking steering wheel, ratcheting gear level, and lots of fun sounds, lights and music. There is also a baby-safe mirror for self-discovery. The brand also offers the ultra-modern accessory for the latest kids’ favourite toy – a tablet. 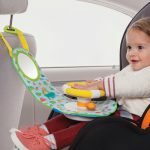 The item serves as a 3 in 1 while traveling, holding the tablet in place to play videos from and kids to watch forward facing, and for the early days comes with a rear-view mirror, with both also acting as a seat protector from baby’s kicks. The beautiful Taf Toys musical arch owl is another item on special offer and quite representative of the brand’s products in terms of colourings, qualities and features. 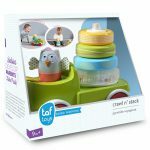 Last but not least is the Taf Toys Crawl and Stack Toy, an award winner – scoping Silver at the Made for Mums 2016 for Best Learning Toy. The item is a colourful truck, with a detachable stacker with flat easy grip rings, one of which is transparent and filled with colourful beads. When the truck moves along the stacker rotates with the beads creating a visual and auditory delight. It’s great for encouraging movement and developing fine motor skills and eye-hand co-ordination. Now is a great time to take advantage of this special offer from Taf Toys. Log in now to review prices and place order, or register for a trade account here. Hurry the sale ends soon!